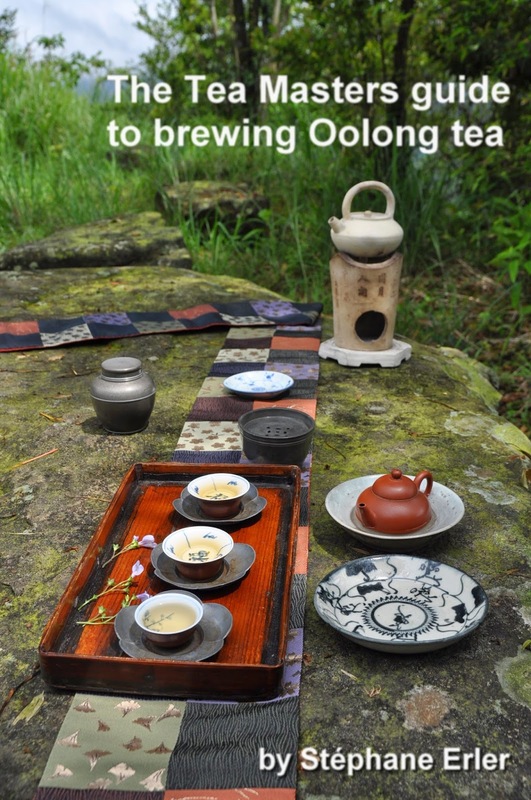 The cradle of Oriental Beauty Oolong is located in the small adjacent towns of Beipu and Emei in Hsin Chu county. That's where I visited one of my farmer's beautiful plantations of Qingxin Dapang tea trees last week. 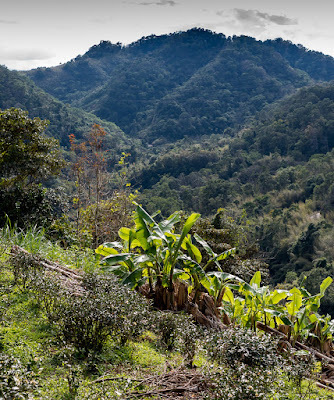 Not only is the plantation located on the slopes of a nearby hill (which helps drain excess water from the field), but it's also grown in organic fashion. 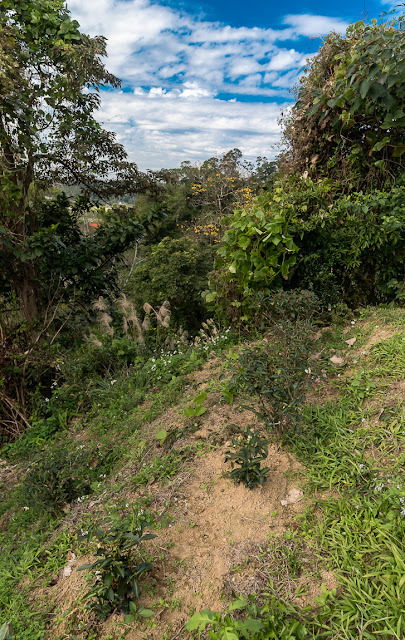 We can see that the trees are sparse and surrounded by other plants. While many tea trees see their flowers wilt within days of their bloom, the Qingxin Dapang flowers can last 1 month. 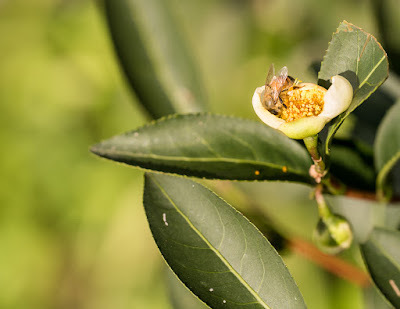 I wonder how honey made from tea flowers tastes like?! Would it have some tea scent? There are also a few banana trees next to this plantation! 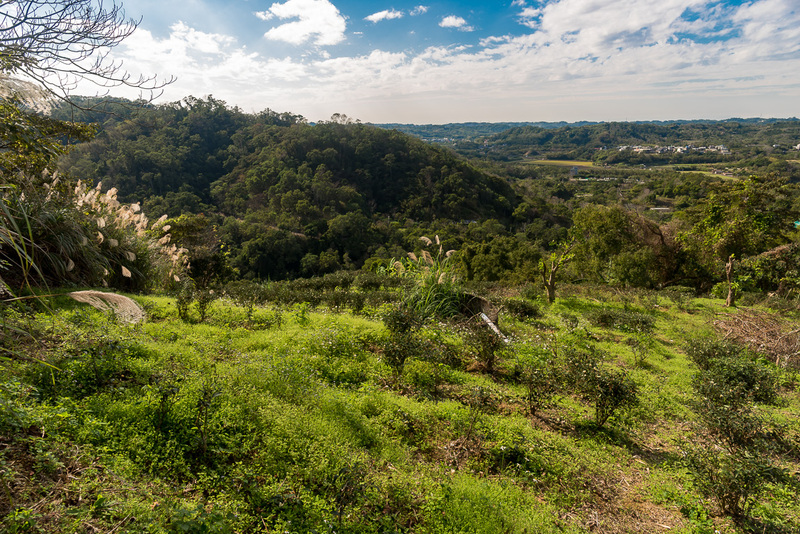 It's a joy to see tea trees so well integrated in this diverse flora. 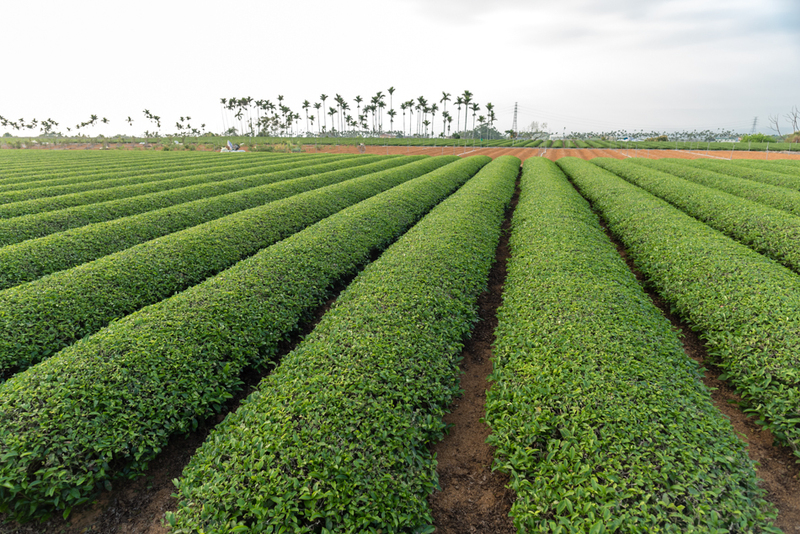 This method requires more effort from the farmer and assumes that the cut branch is healthy. He had to dig holes and bring lots of water to water the planted branches. But this method is sustainable and ensures that what he plants is suited for this place. 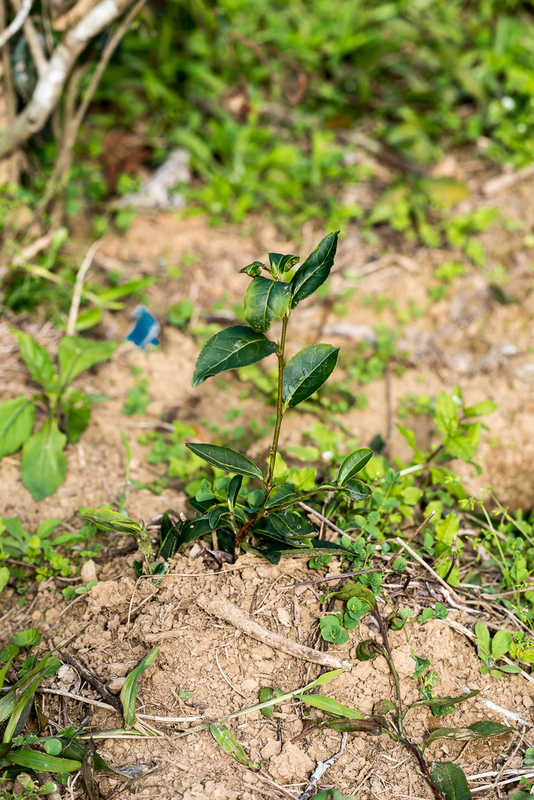 It's an important point to grow the cultivar most suitable to your terroir (the natural environment that is formed by the soil and the climate). 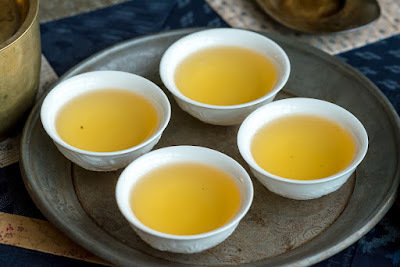 In fall 2012, I tasted over 10 different OBs made from different cultivars and concluded that Qingxin Dapang is, indeed, the best cultivar for this type of Oolong. 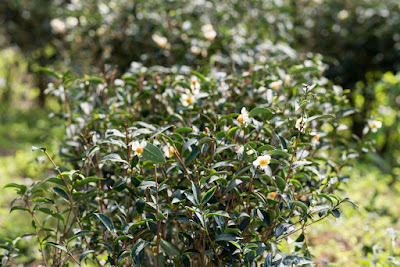 That's the reason why this cultivar is most used in Hsin Chu county where farmers specialize in this process. 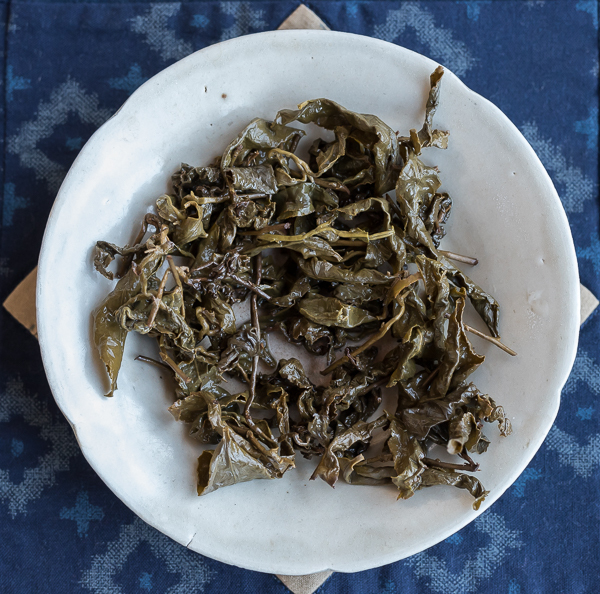 It was harvested by hand in Guanxi (near HsinChu, Taiwan) on October 26th and had just been lightly roasted. This production batch came in a bag of 2.5 kg (only!) The nice thing about it is that it's not blended. That's why its taste feels so pure and the aromas are so clear and clean! I also liked the fact that you could taste the winter character in this OB. Since the weather is cooler, less sunny, the oxidation level of the leaves is lower than in summer. The fragrances have higher notes and are more perfume like. I used barely 2 grams in my silver teapot. Since it's made of buds and recently roasted, I didn't let the tea brew long. That's why the first brew looks rather pale. But its fragrance is magnificent! It's also a beauty, but a different beauty. It is more pure, refined and elevated. The taste is sweet and clean, but still a little bit dry due to the roasting. 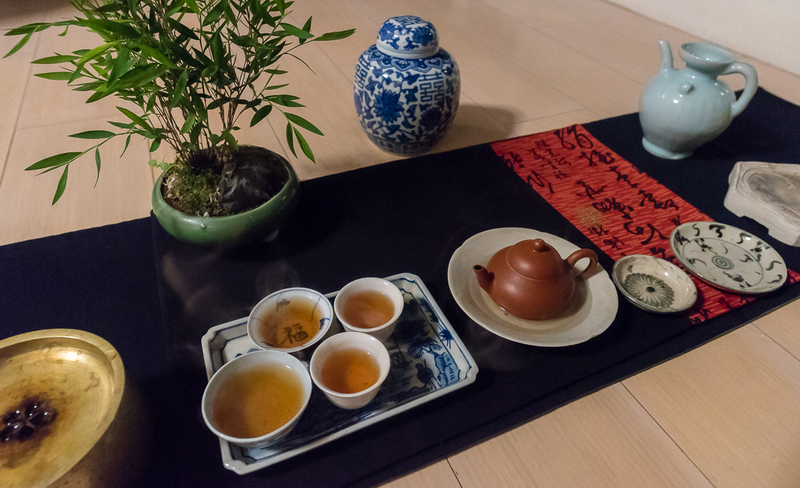 Like the 2016 summer OB tradition, this is also an Oolong that is going to improve with time. The next brews had more richness and sweetness, but still with this wonderful purity and clarity that is visible in the brew! That's why I chose a branch of raw cotton on my Chaxi as a symbol for this natural purity. 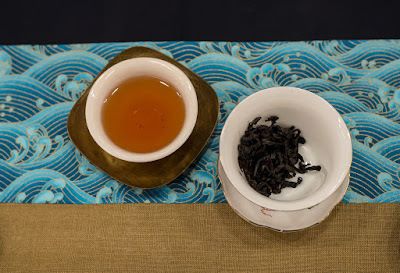 My brewing advice for this winter OB is to use fewer leaves, a slow pour and rather short brewing times in order to emphasize the lightness and refinement of its character. 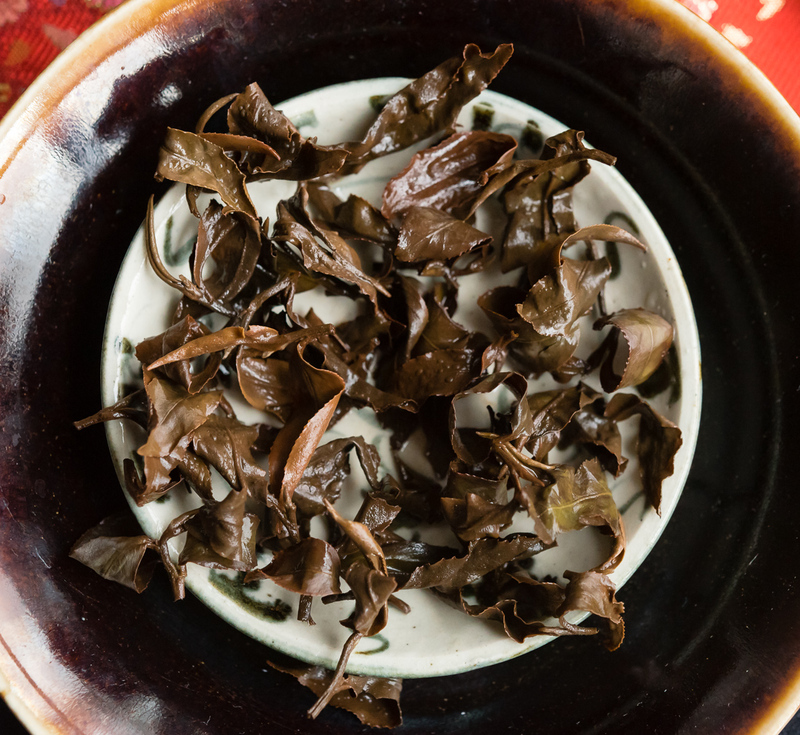 It's also a very good tea for aging. 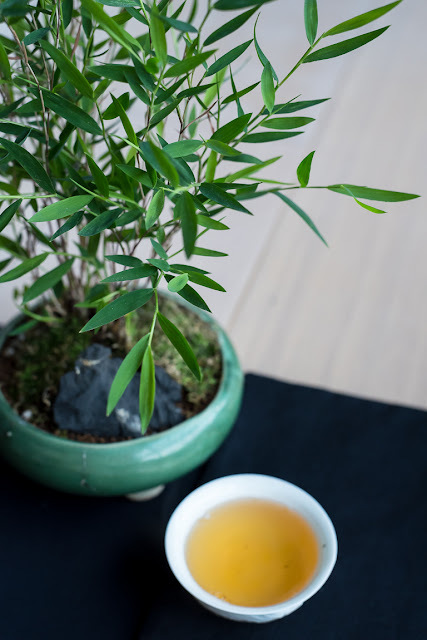 Le chabu vert et le bambou sont le printemps qui commencent à poindre. Ce sont 3 jours ensoleillés (comme les coupes) qui suivent des jours frais et sombres (le long tissu bleu et noir). 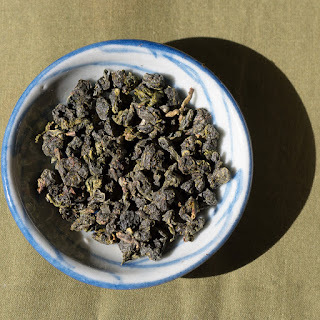 Des bourgeons blancs (comme neige) de thé puerh sauvage sont les enfants du dernier renouveau saisonnier (au printemps 2017). Je les infuse dans une théière zhuni rouge de couleur festive et chaleureuse sur une assiette qinghua bleu et blanche comme glace. 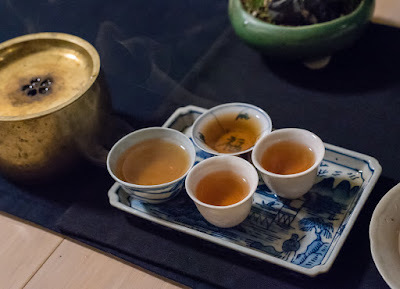 Le thé chaud nous fait du bien, mais il s'apprécie d'autant plus qu'il fait froid! Les choses qui s'opposent ont besoin l'une de l'autre pour exister et se mettre en valeur. Ainsi sans froid il n'y aurait pas de bonnes feuilles: le froid de l'hiver oblige les théiers au repos, réduit la prolifération d'insectes nuisibles, la fraicheur de la nuit dans les plantations préserve les arômes les plus fins, et le froid matinal condense la rosée qui nourrit les feuilles en l'absence de pluie. 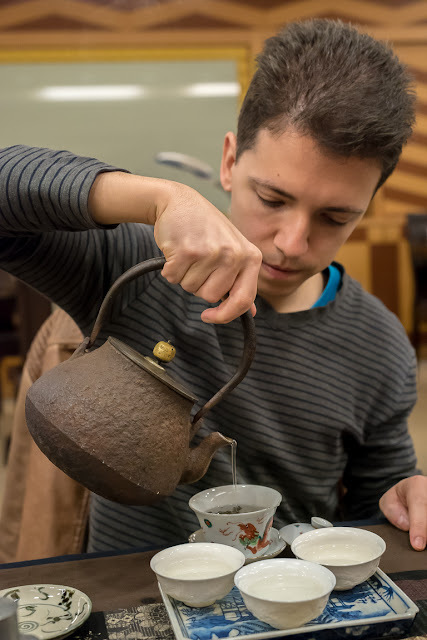 Et finalement, le froid préserve la fraicheur des feuilles de thé qu'on conserve chez soi. 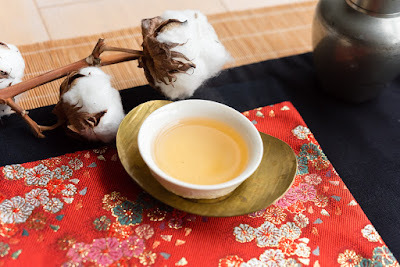 Finalement, un bon thé chaud nous donne le souffle frais! 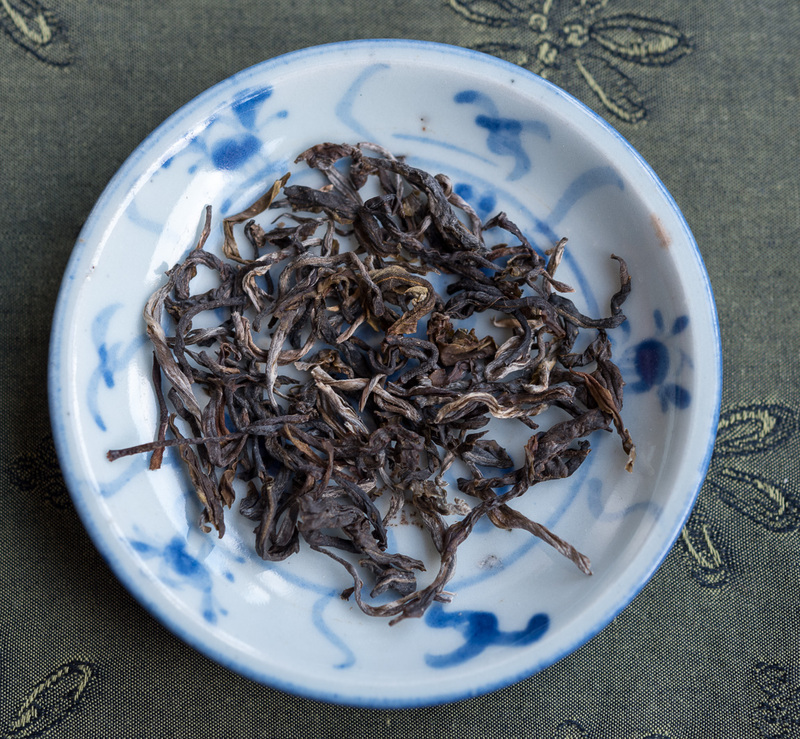 C'est le cas ici tellement le palais est clean et pur après une coupe de ce puerh. Le plaisir du thé est aussi affaire de contrastes! Le fin mot de ce Chaxi, comme dirait Raphaël Enthoven sur Europe1: L'harmonie n'est pas monotone! 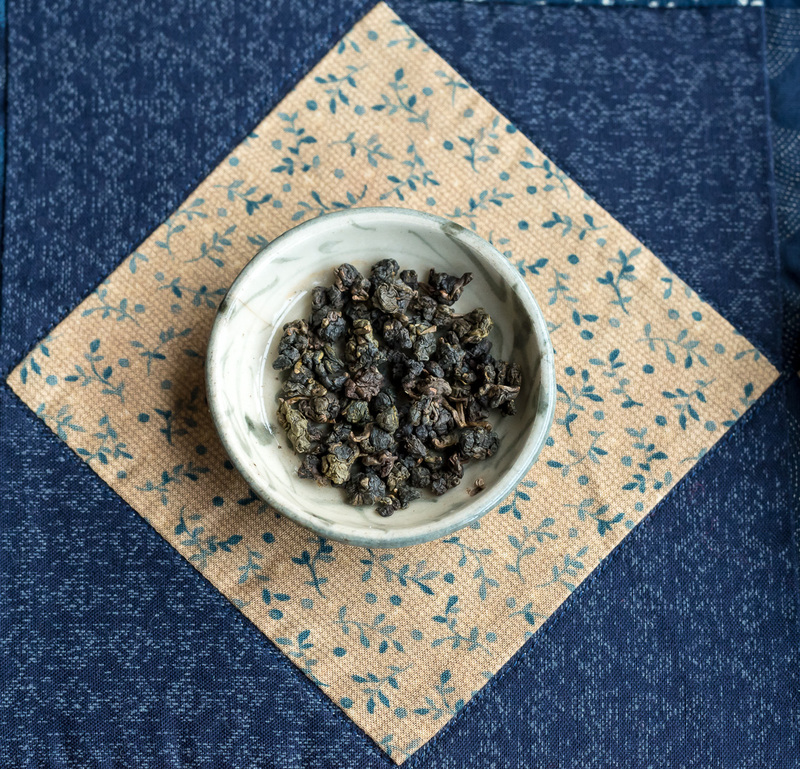 The first Oolong of 2018 is here already thanks to a warm January in central Taiwan! 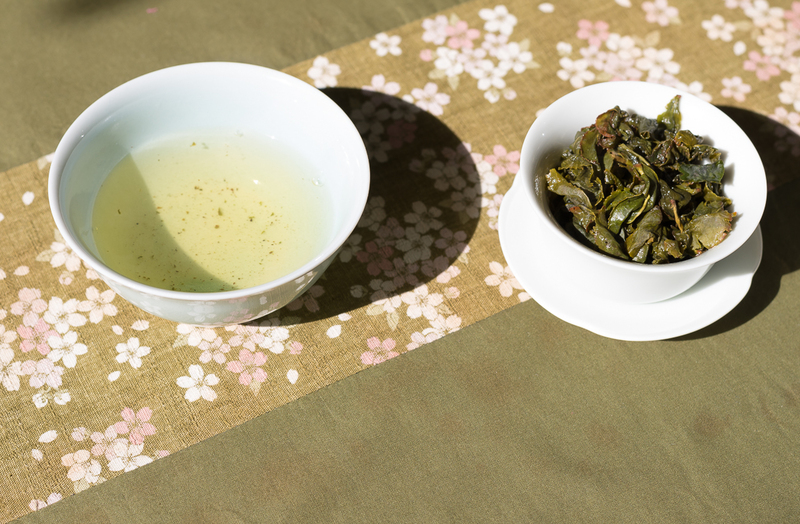 Process: lightly oxidized Oolong, rolled, dried but not roasted. Here, I brew 5 grams in a mini gaiwan and drink it in Michel François's celadon cup. The idea behind this choice of ware is that this is a light, everyday Oolong that can be drunk in a big cup without the complexity of having several small cups. 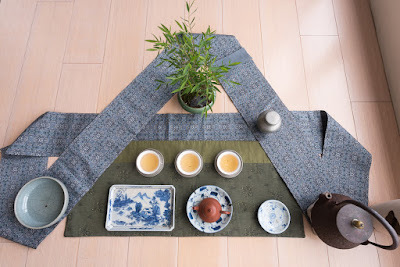 I also prefer this setup to using a chahai (pitcher) and a cup, since having a big cup means only 1 transfer (gaiwan to cup) instead of 2 (gaiwan to chahai to cup) and this means less heat loss. Besides, the celadon color for the gaiwan and the cup enhances and clarifies the fresh hue of the brew. This is a good fit for a freshly harvested and lightly oxidized Oolong. The green chabu with plum flowers is a symbol for the resilient plants that grow during winter and give their finest scents. 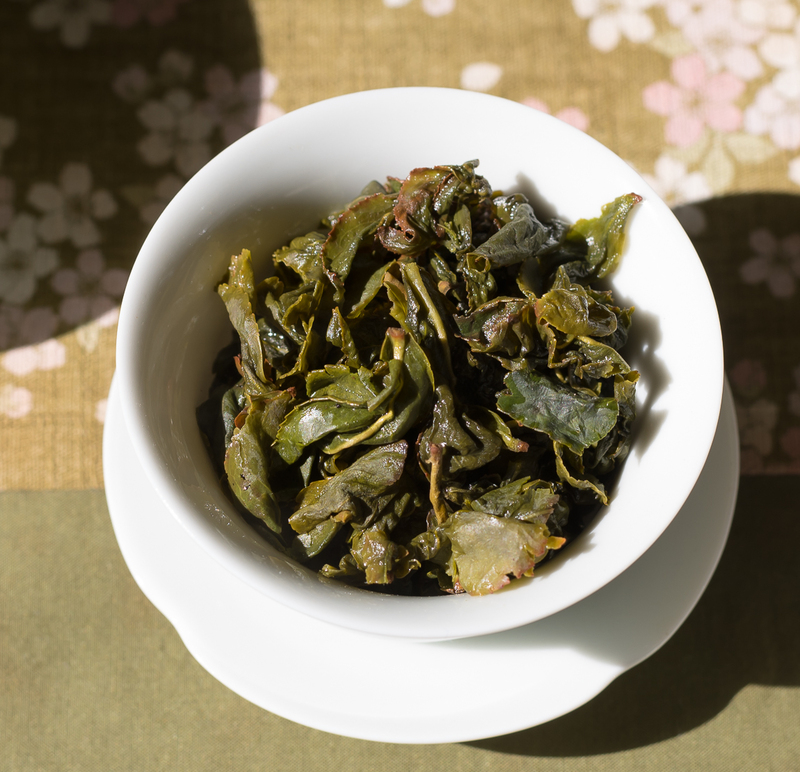 The late winter, Dong Pian harvest produces the sweetest and lightest aromas of Si Ji Chun of the year! (The reason is simple: the winter weather conditions in Mingjian are similar to spring in the high mountains: sunshine during the day and cool temperatures at night). 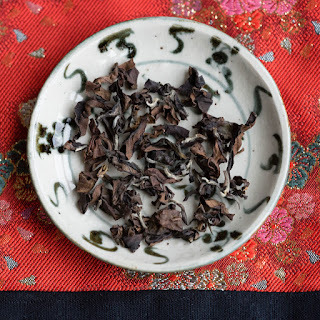 And, in the picture above, we can see that the leaves have some red edges: the oxidation level isn't too green and this also explains the sweetness of the brew. Si Ji Chun sums up well the weather in Taiwan: it's always spring, green and full of life! 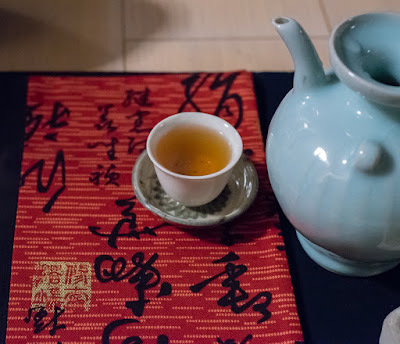 For this week's tea class, Ms. Zhang came up with this Chaxi for a high mountain Oolong from Qilai. 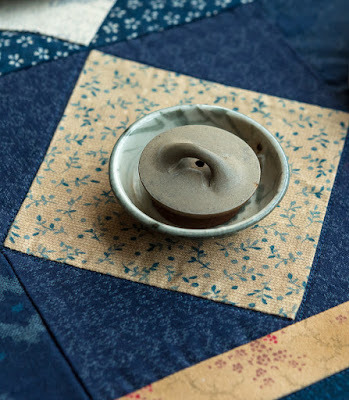 Since she doesn't have a dedicated Chabu, she thought of using her grey 'meditation blanket' and a purple fabric on top. 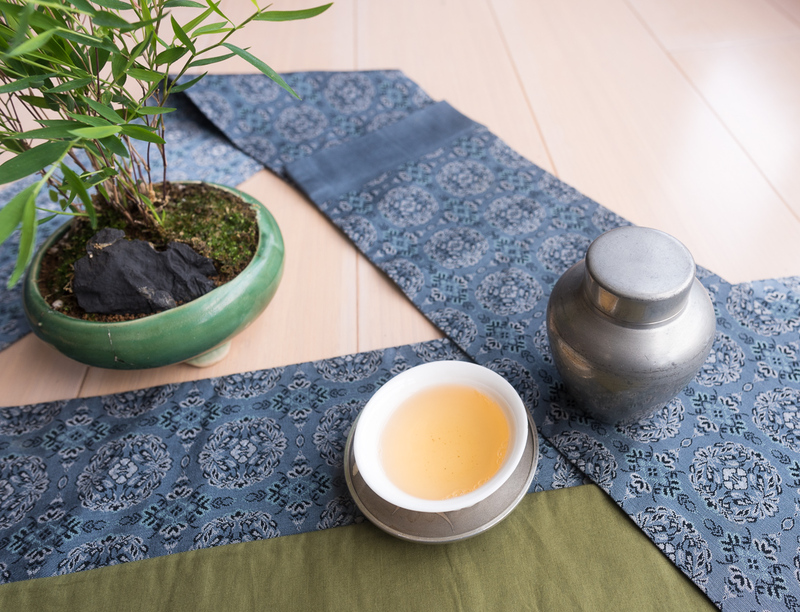 The material and color of these 2 fabrics is very suitable for a cold winter day. Ms. Zhang said she often puts this blanket on her knees to keep her warm at her desk when it's particularly cold. This adds a personal, intimate touch to her Chaxi. 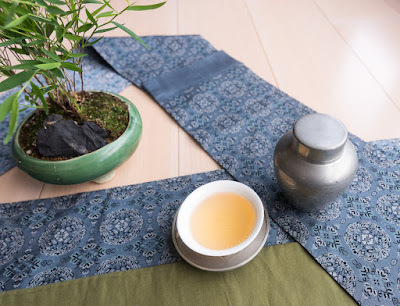 It's very much in the 'Mitate spirit' I spoke about 2 days ago to divert an object from its original purpose and find a new use for it in our Chaxi. 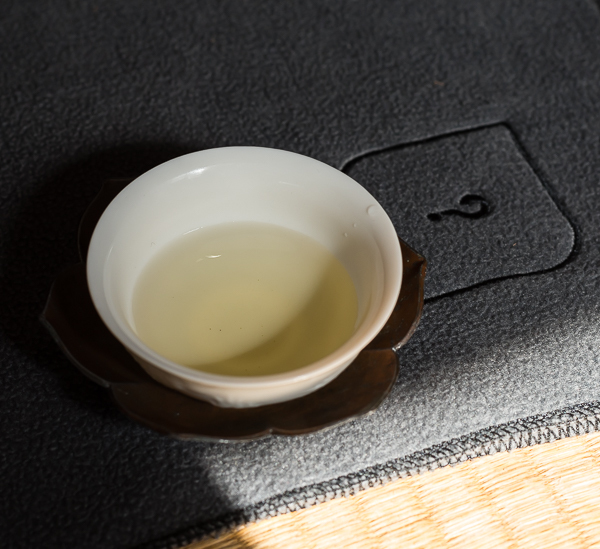 This question mark is a symbol to remind her that a Chaxi is also a good moment to check on yourself and ask if you're satisfied with your life, your job, your friendships... A fresh high mountain Oolong clarifies the mind as well as the palate! It's also likely to provide a warm, benevolent feeling that can help you answer your questions with a compassionate attitude. Making tea for oneself (and others) should be a very relaxing and pleasing experience. It's in such a state of mind that we are most likely to find positive answers to our questions. 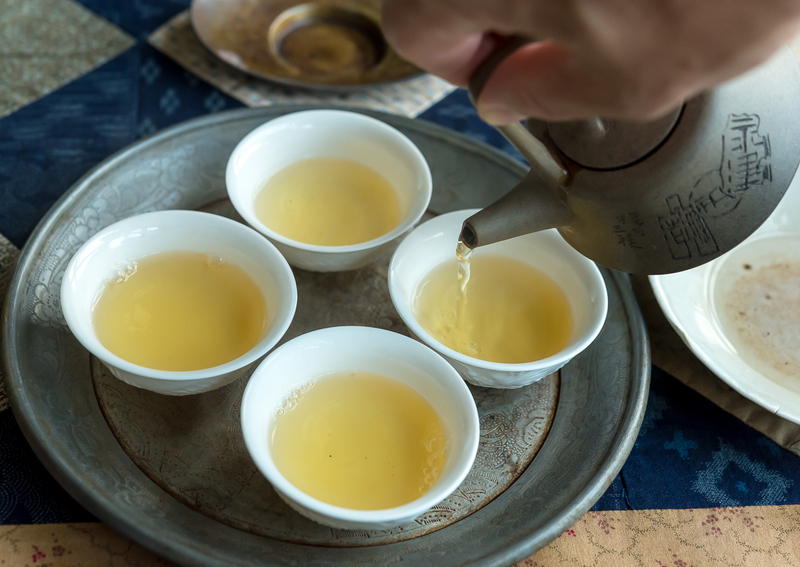 And a calm mind produces a steady hand and a steady pour in the teapot which in turn produces a sweeter and more harmonious cup of tea. That's a very basic and practical reason why a zen spirit and tea go hand in hand. - How well did I brew my leaves? - In case I'm not pleased, is the bad taste due to the leaves, to my brewing, to my (faulty) accessories, to the quality of the water? - How can I improve my tea experience? - What's the taste of a great tea? 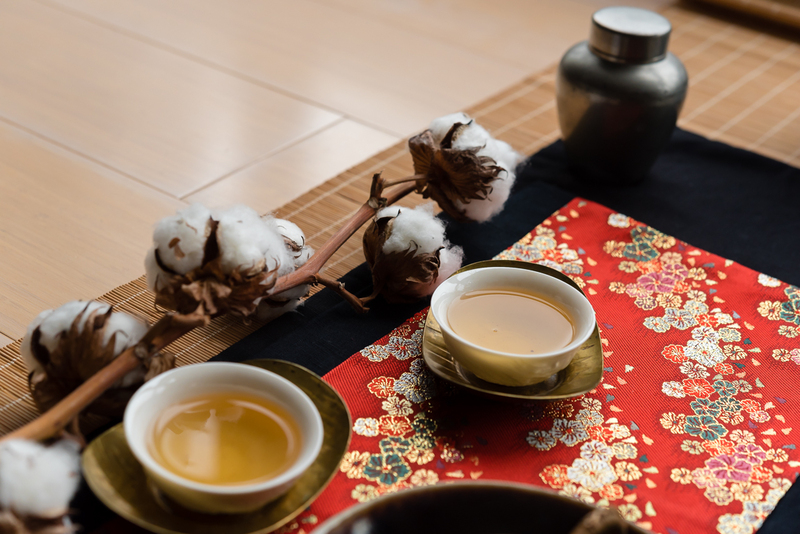 - What does a Chaxi add to my tea experience? - Is this Chaxi a reflection of my personality, my creativity? 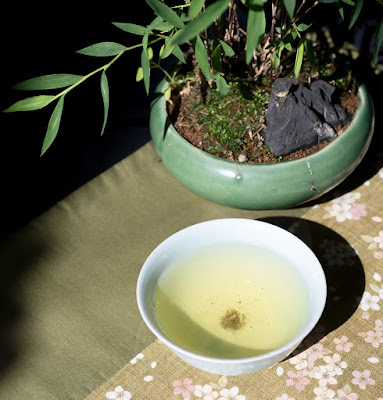 - Should I have fixed parameters for the weight of the leaves, the water temperature, the brewing time or should I adapt these parameters to each new tea and situation? 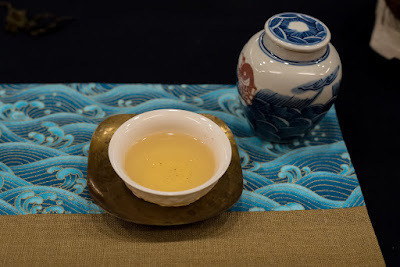 Now, here are pictures of the Chaxi I told you lately, where I used too many leaves of this wonderful top Hung Shui Oolong from Dong Ding from this winter. When I realized that my first brews were too intense, I was partially able to salvage the later brews by drastically cutting the brewing time. This led me to recognize again this simple truth that 'less is more' is often true in tea. And that quality supersedes quantity. In this blog, among others, I try to show and tell how I'm answering some of the questions I've listed above. There are many ways to brew tea and very few are wrong, because if they were the brewers would realize and change. 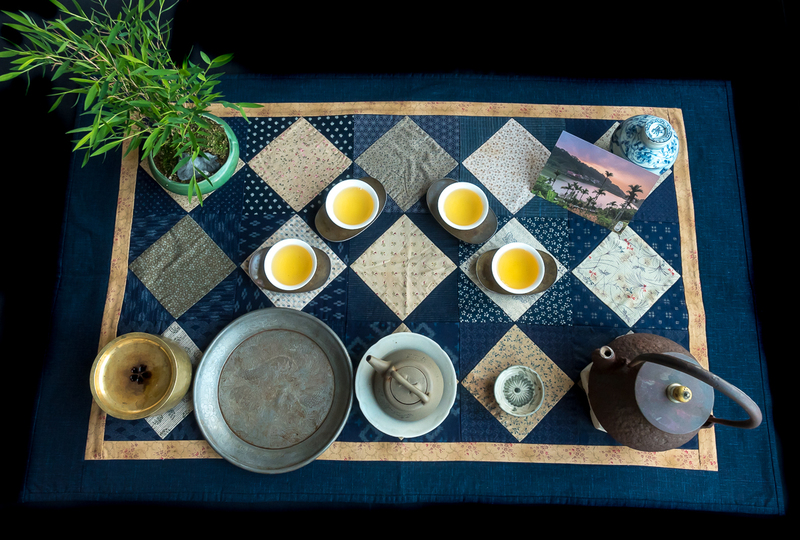 But many methods come with trade offs to make it easy (by using a Chahai), quick, casual... because time is limited, because you're brewing in the office or on the road... 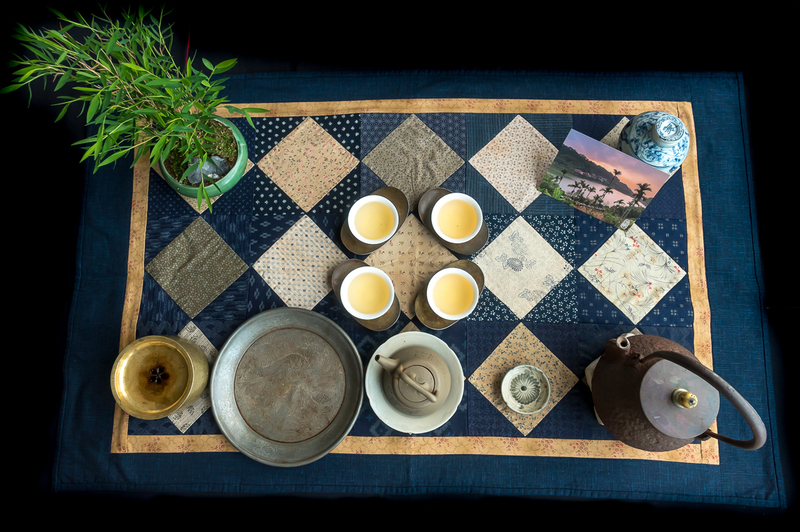 The Chaxi I find worthwhile sharing, on the other hand, are my attempts to make the most of my tea moments and provide a complete experience for the senses and the creative mind. How great can this moment become if I put all my passion? How can I create a Chaxi that answers the question: where would I rather be now? with "here!" There should be no better place to brew tea than at home! Comment apprendre le thé? Comme pour le vin, c'est en le dégustant et en sachant exactement ce que l'on déguste. Si l'on est débutant, on commencera par goûter à des thés de familles différentes (blanc, vert, Oolong, rouge, puerh par exemple). Mais pour progresser, on concentrera sa leçon sur des thés plus précis, plus proches les uns des autres afin d'apprécier ces petits détails qui changent avec des feuilles différentes bien que similaires. 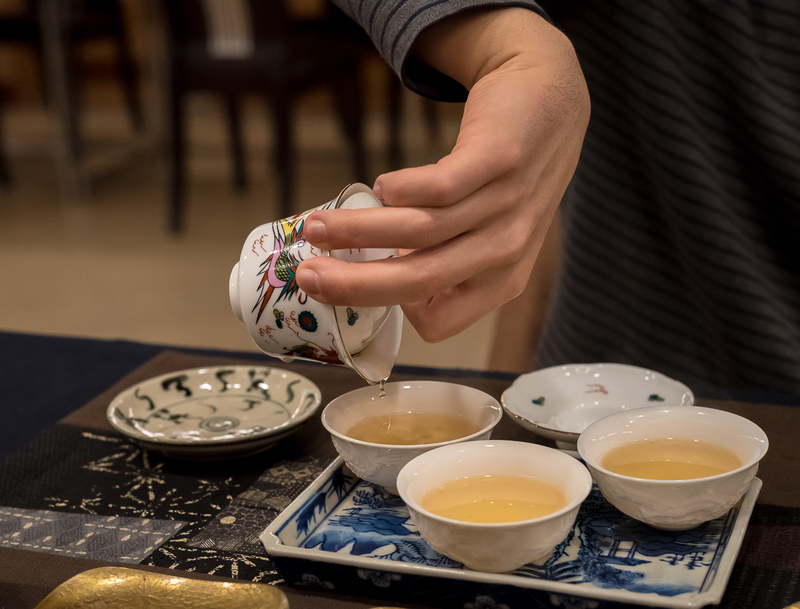 Pour cette leçon focalisée sur les Hung Shui Oolongs de Taiwan, j'ai préparé 2 Chaxi. 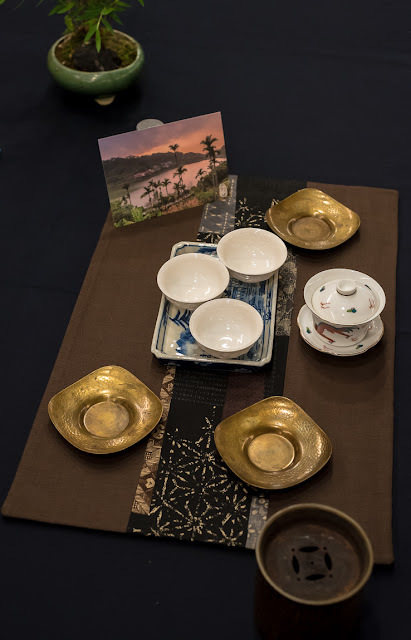 Celui ci-dessus est pour mon élève (il a un plateau qinghua en porcelaine sous les tasses afin de ne pas tacher le Chabu). Mon Chaxi ci-dessous n'a pas de plateau. 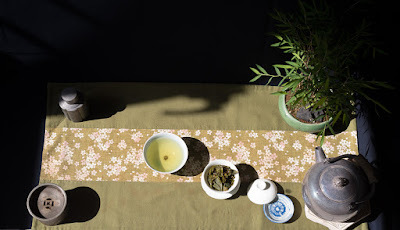 Mon challenge sera donc de ne pas renverser de thé sur le tissu brun pendant mes infusions. 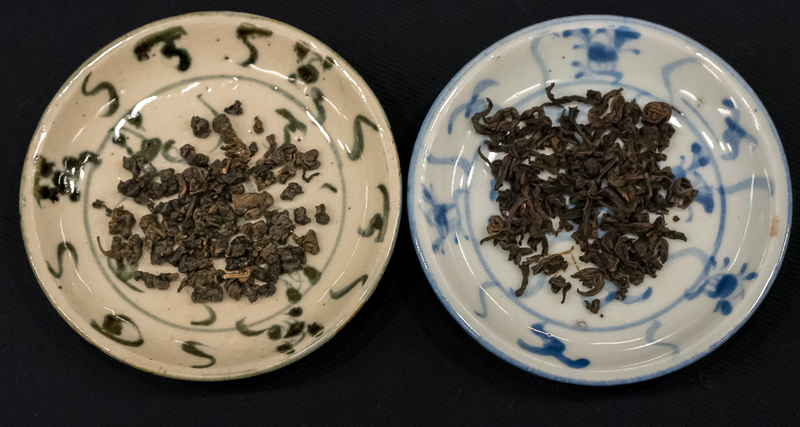 2. le concours de Dong Ding est ouvert à tous les fermiers de l'ile pourvu que le thé soit produit selon le mode Hung Shui, si bien que les gagnants de ce concours 'Dong Ding' proviennent souvent des hautes montagnes de Shan Lin Xi ou de Lishan. Ensuite, nous avons infusé le top Hung Shui de Dong Ding de cet hiver également. Sa torréfaction était un peu plus légère, ses feuilles plus vertes et surtout plus petites. Cette taille réduite est due au cultivar qingxin Oolong et au fait que les feuilles furent cueillies relativement tôt. En haute montagne, par contre, on remarqua que les feuilles de qingxin Oolong de ce Hung Shui Oolong de compétition de Shan Lin Xi sont plus matures et longues. Nous remarquons aussi que le style 'compétition' est plus fortement torréfiées que mon batch de Dong Ding d'hiver 2017 dont la fraicheur est particulièrement bien préservée. 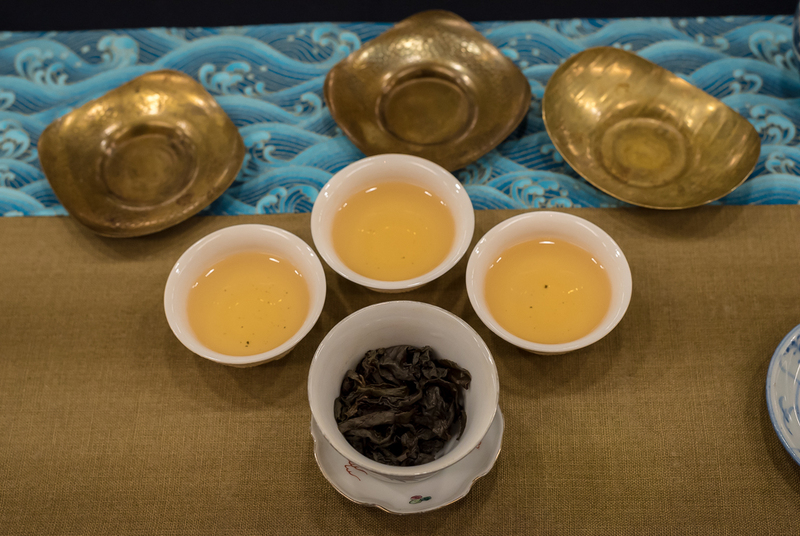 La famille des Hung Shui Oolongs recouvre un large spectre de torréfactions et d'oxydations. Avec ces deux variables, il est possible de produire des thés avec des arômes très différents: un mélange de fruits mûrs, de miel et de mélasse, ou bien de céréales grillées comme le malt ou le riz soufflé, parfois si intenses qu'on dirait du whisky (sans l'alcool!) Parfois, il y a encore une certaine fraicheur sous-jacente quand la torréfaction est bien faite. 2. Hung Shui Oolong de Dong Ding de 1979 qui a un degré de torréfaction plus important et dont les feuilles sèches ont eu le temps de s'ouvrir. Bien que ces 2 thés âgés aient perdu leur odeurs torréfiées, il vaut mieux les infuser tout doucement afin d'accentuer la longueur en bouche. On voit clairement que les feuilles de 2003 s'ouvrent très bien et que l'infusion couleur or démontre un très bel équilibre. 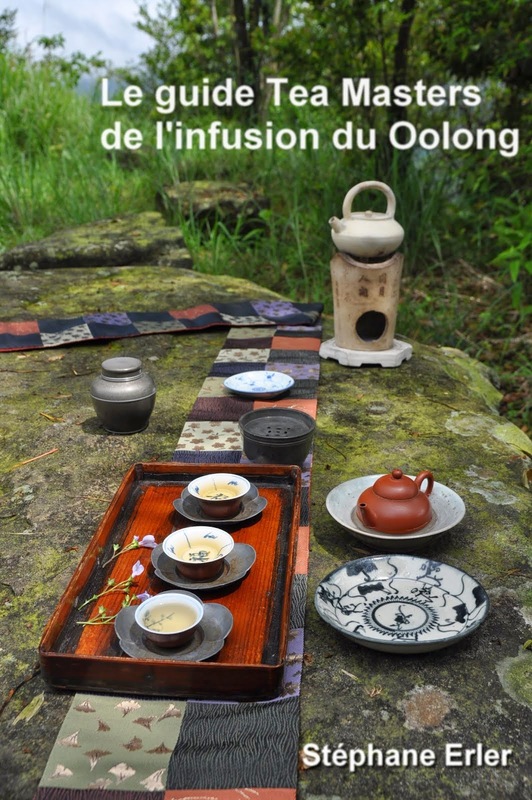 Au nez, ce Hung Shui Oolong d'une quinzaine d'année a complètement perdu ses senteurs torréfiées. A la place, on a des senteurs qui font penser à ces magasins de parfum Duty Free dans les aéroports! L'odeur dominante est l'osmanthus. Le goût est dansant et pur. C'est un Oolong qui ne laisse pas voir son âge, juste sa qualité! Pour celui de 1979, la première infusion est très surprenante. Elle a une bonne dose d'acidité (Wuyi suan est le terme technique chinois), qui, heureusement finit par des notes plus sucrées. On dirait un vin de prunes autant au niveau de l'acidité que des arômes. 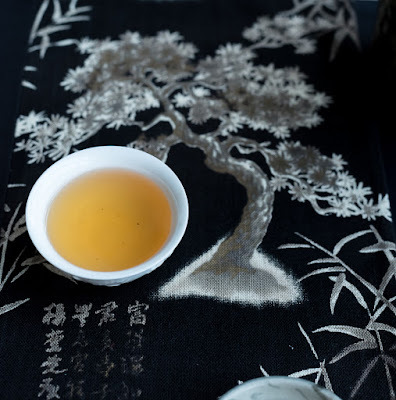 Les prochaines infusions sont plus douces, moins acides, mais les notes restent puissantes. On sent plus le bois noble et ancien maintenant. Par contre, les notes de torréfaction ont aussi disparues. 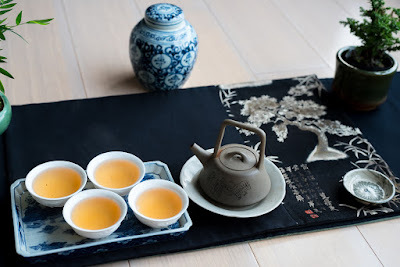 En parallèle à cela, j'ai réussi mon challenge: je n'ai pas taché mon Chabu malgré le grand nombre d'infusions de ces 5 Hung Shui Oolongs! 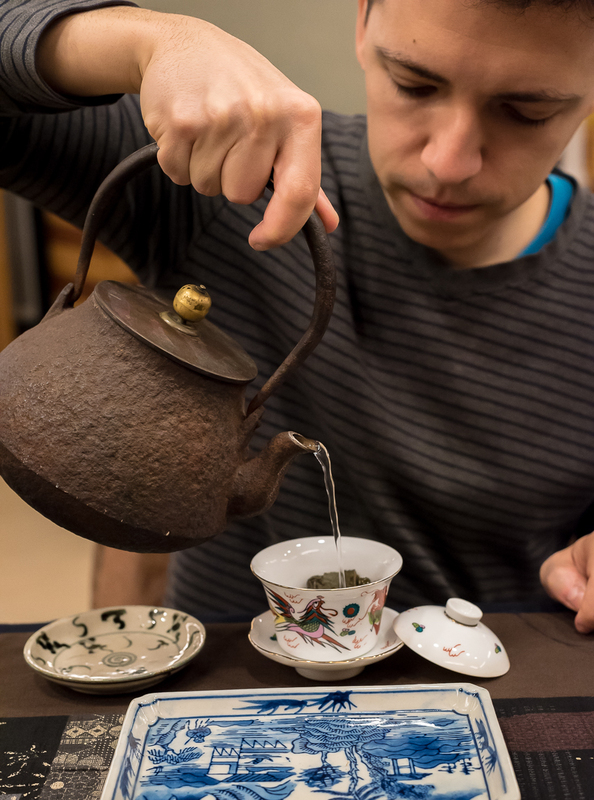 It's difficult to brew tea perfectly. I confess that it doesn't happen as often as I'd like. It's a constant challenge and I'm the first to notice when I merely brewed a good rather than a great cup of tea. But that's also what makes tea so interesting. And that's what I try to show to people who come to have tea with me, that when we are brewing the same tea we get different results. If my cup is better, it's because I have been spent a lot of time to improve my brewing technique. I even wrote a guide to share what I've learned! When I notice in the blog that my cup is better, my point is not to show off but to make my readers realize that the brewing is essential. This is something that is difficult to experience when you brew alone, but it's something that I'm tasting at every tea class: a tea can go from flat, average to deep and excellent just through the proper way of pouring water inside the teapot! But sometimes the problem lies somewhere else. 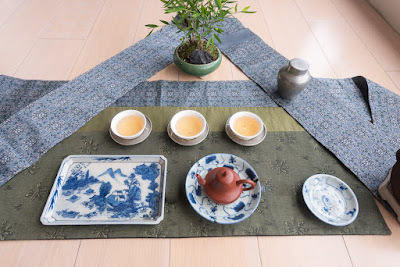 Usually, for gongfucha, tea prepared in a small teapot, the more (roasted Oolong or puerh) leaves, the better, because the tea will taste more concentrated and intense. 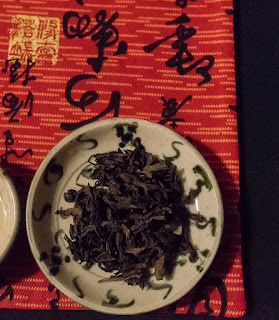 In that spirit, I brewed this top Hung Shui Oolong from Dong Ding with a fair amount of leaves last week. I found the result quite disappointing (too rough and to strong), even when brewing the leaves for a very short time with this same Duanni teapot. This time, I drastically reduced the amount of leaves for my brews. (See above). Instead of weighing the leaves, I use a very small antique qinghua plate to display the leaves I was about to brew. 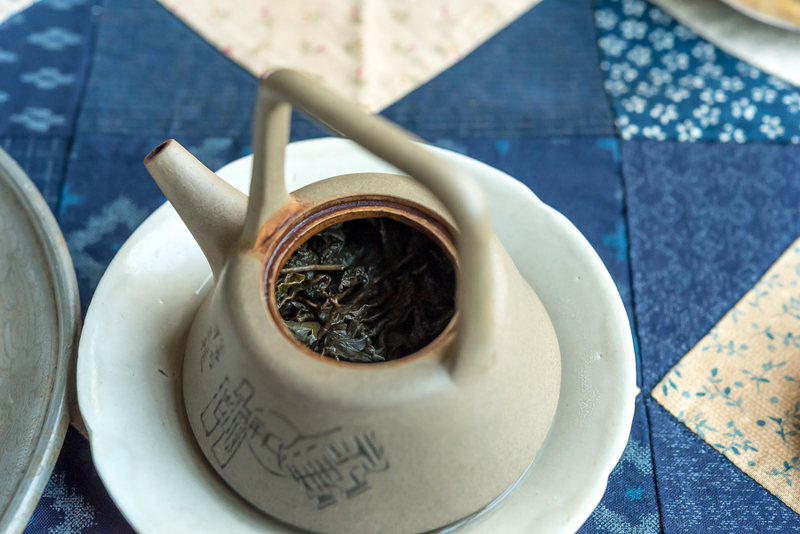 Usually, the rule is to roughly cover the bottom of the teapot with dry leaves. This time it was just half covered. 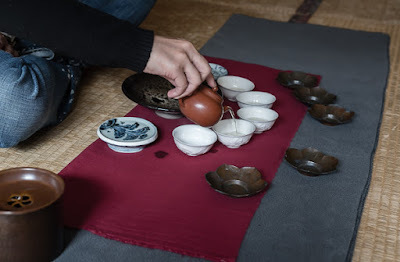 While pouring water in the teapot, this small qinghua plate can also be used to place the lid on it. This small plate must have had a different purpose when it was made some 100 years ago. 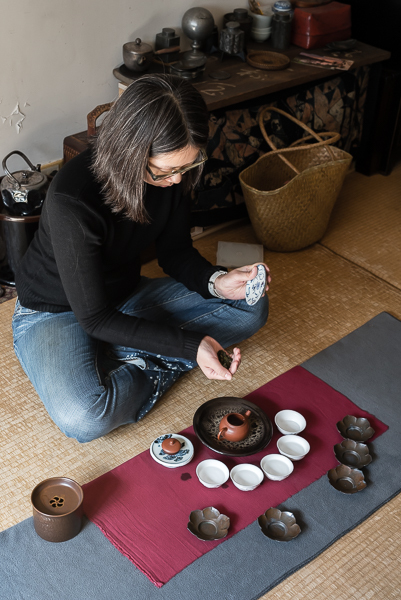 Using it to display/measure the leaves and for the lid is what the Japanese would call a Mitate (見立て) whereby the tea master finds a new, tea related purpose in a Chaxi for an ordinary object. 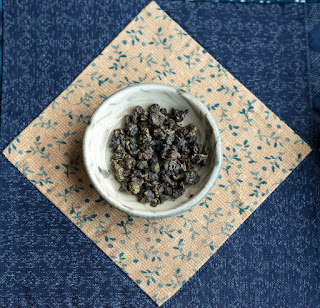 With fewer leaves and slow brews, this Dong Ding Oolong was able to express all its finesse, sweetness combined with its underlying freshness. Now it's close to perfection, I thought! The roasting aromas and the tea aromas are in harmony and not overshadowing each other. 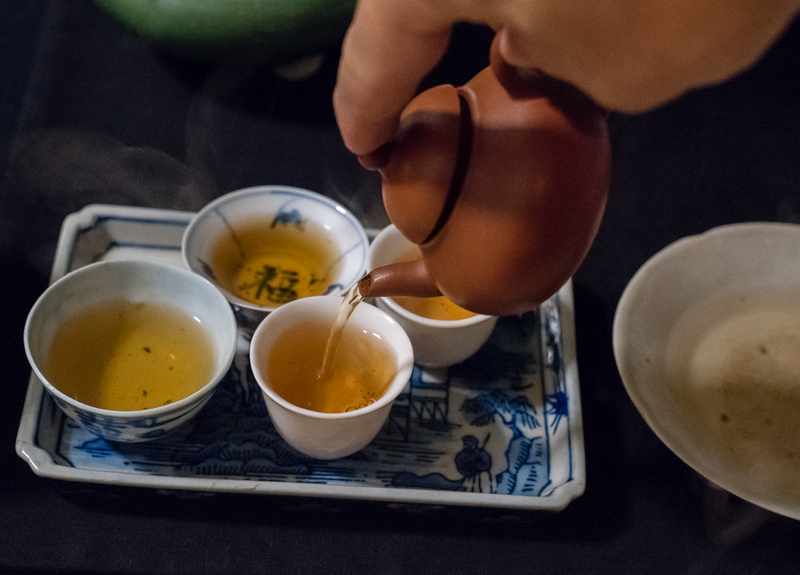 And the tea feels alive, dancing on the palate, sweet in the throat and slowly melting away. 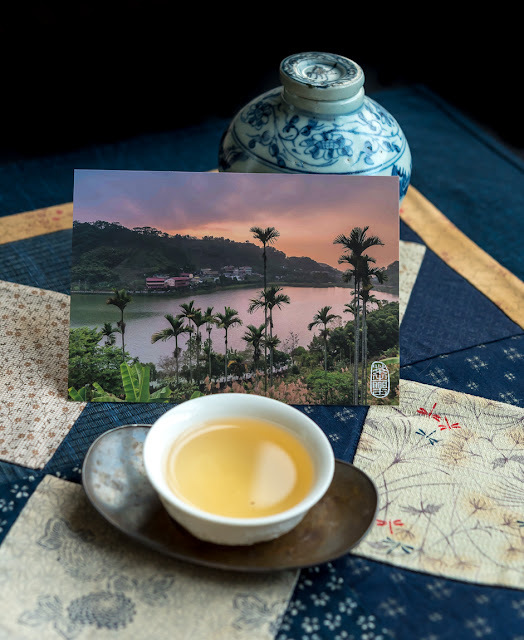 On this postcard we can see Qilin lake and Oolong plantations that are part of the Dong Ding village where Dong Ding Oolong started! Addendum: the open leaves after the brews. They are quite small and therefore well concentrated. Despite the title of this article, this isn't a Chaxi devoted to the movie about Winston Churchill. In my previous article I found inspiration in a book by Alexandre Dumas and I could also do one about Chuchill. The last lion, Winston Spencer Churchill Alone, by William Manchester, is one of the few books I brought along when I moved to Taiwan in 1996... For a Churchillian Chaxi I would definitely use my teapot with a painted lion that dates back to a different time! 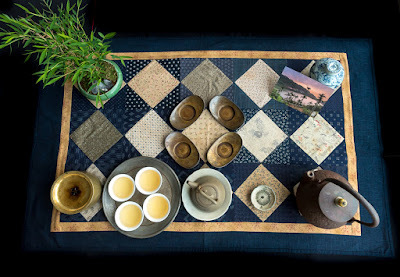 But this Chaxi is literally and simply about a tea after sunset. 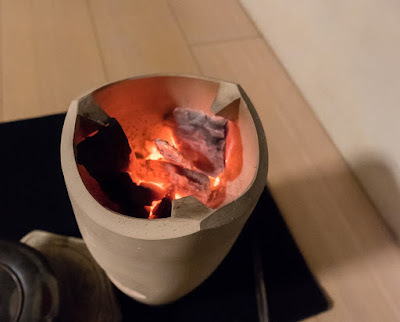 Chinese New Year is approaching and the cold outside temperatures require some red color and fire to warm us up here in Taipei. That's also why I chose a roasted Oolong (from Wuyi) for this special Chaxi since I'm using charcoal to heat the water in my silver kettle..
A small Yixing zhuni teapot from the 1980s is perfect for this tea. The clarity and purity of this tea is simply amazing. 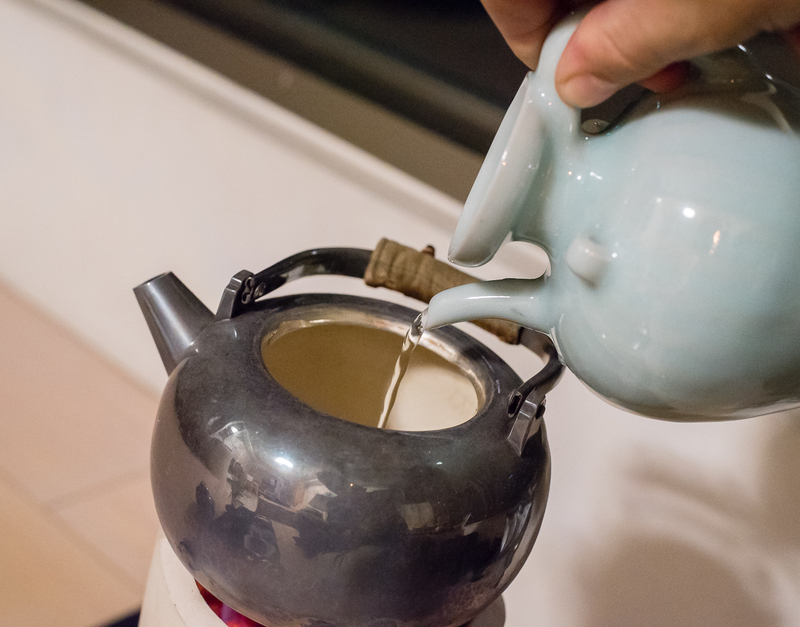 I get to use my celadon ewer when I'm using charcoal, because it's faster not to fill the kettle to the top, but adding enough water for each brew. Once the Nilu is up to speed with the glowing charcoal, the water comes quickly to a boil again. 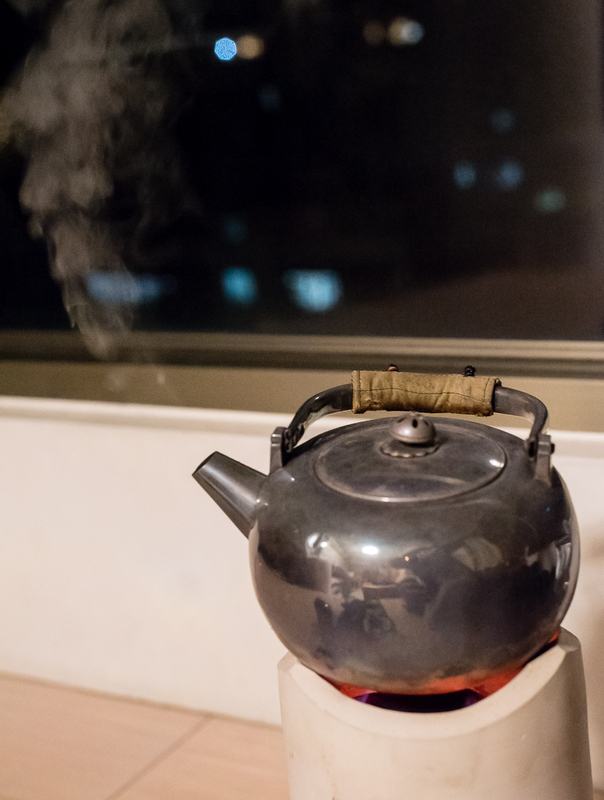 The trick is that it's the kettle to should generate steam while the charcoal shouldn't smoke. 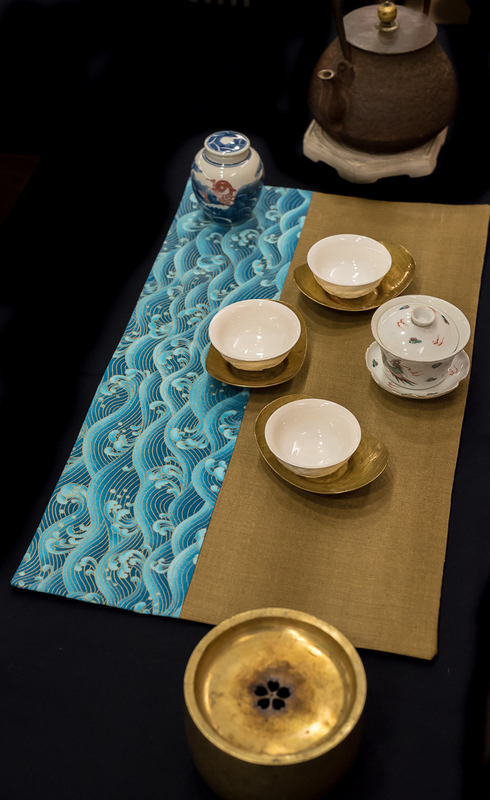 The result is that we are transported back in time to ancient China with this traditional tea and accessories.